Clock Fan for Laptop / Power Bank, Really Cool! 1. Plug into a USB port and press the ON / OFF switch to turn fan on and to activate the clock display. 2. Press and hold the ON / OFF button until minute hand starts blinking. 3. Setting the hour hand:continue to hold ON / OFF button to set the hour hand.The clock will spin clockwise fast,release the button just before the correct hour. We promise Half Year Money Back Guarantee & Lifetime Product Warranty. If you have any issue with your product, contact us and our team will respond to you within 24 hours. 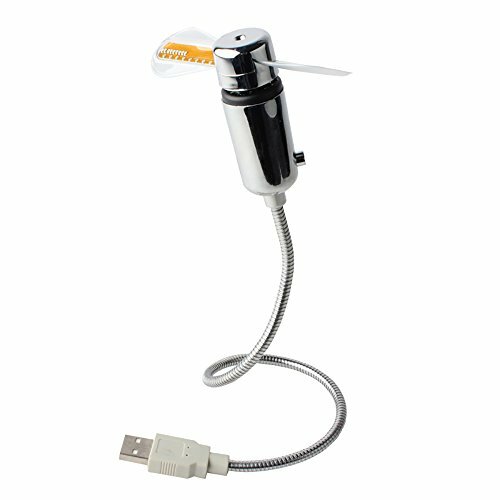 Slim & Light: Slim & light USB fan, displays hour, minute and seconds, practical and convenient. Flexible Design: Adjustable gooseneck directs the breeze to blow into the exact direction as you desired. Plug & Play: It can be connected to any USB port, such as PC, charging treasure, USB adapter. No need any complex. Soft Fan Blades: PVC soft fan blades for safey, red and green LED's create clock face. Safe light with or without frequency change protects your eyes. 100% WRRANTY:180 DAYS 100% MONEY BACK GUARANTEE & LIFETIME PRODUCT WARRANTY. RISK FREE and LIFETIME Limited Product Warranty. If you have any questions about this product by GooDGo, contact us by completing and submitting the form below. If you are looking for a specif part number, please include it with your message.